Lindsay’s exploration into yoga started over 10 years ago. Initially it was the strength and flexibility she found in her body that really made her fall in love with the practice. As she explored yoga more she gained a host of tools to help deal with everyday life. This is what really got her hooked. Learning breathing and meditation practices to help with sleep and stress relief to learning to listen to her inner voice and honoring it. The ancient wisdom of yoga and ayurveda is constantly amazing her. The knowledge that we can heal ourselves through our breath, movement and natural foods should be something that is shared with everyone. She has pretty much decided that yoga can cure anything… anyone who talks with her can confirm this to be true. She completed her 200 hour YTT in Nepal in 2017 and she hasn’t looked back. She believes that yoga is for everyone and every ”body” that is why she has chosen to educate herself in a variety of types of yoga from chair yoga and restorative to hatha and ashtanga. 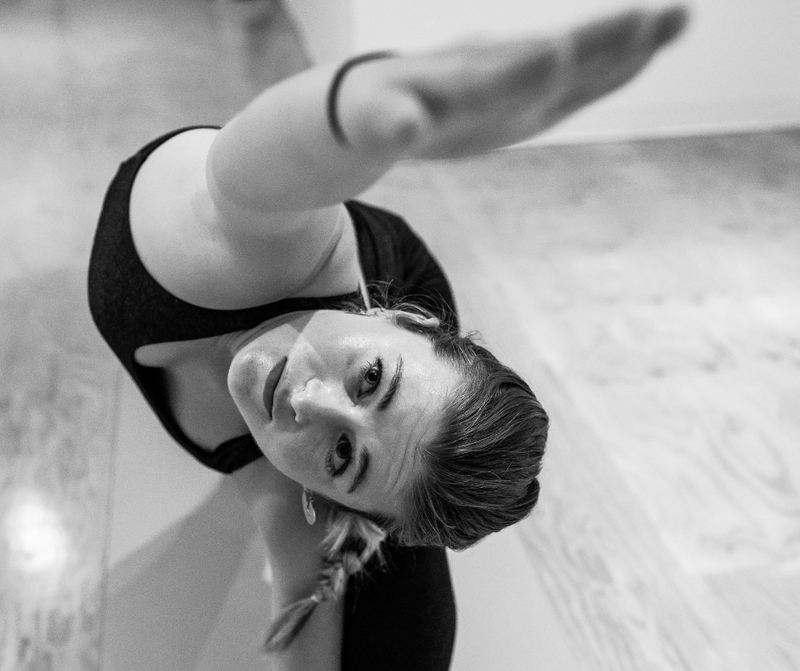 She loves the creative freedom that teaching yoga offers her. She loves the challenge of stepping into the room and creating a class that is unique to the individuals in that class. This means that no two classes are ever the same. She has a deep love for pranayama and this is what usually starts out her mornings. The clarity, focus and alertness that it brings can't be beat (even by coffee). When it comes to asana her favourite practice and go to is always an ashtanga based vinyasa flow followed up by a passive yin practice. Weird fact about her is that she loves loud music with lots of bass. Like the kind that you find at a music festival when your standing in front a wall of subs and it literally takes your breath away….mmmm so good. She also love the freedom these festivals allow to be your truest weirdest self which includes any number of crazy costumes and connecting with others humans that aren’t afraid to let their walls down. You have brains in your head.